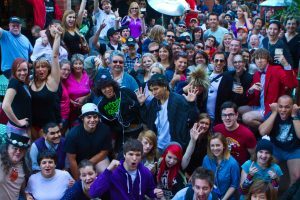 The fourth No Pants Light Rail Ride was last Sunday here in Phoenix as part of Improv Everywhere’s global No Pants Subway Ride, and it was a rockin’ great time. About 250 people hit the rail, taking the train into Tempe and then walking (or strutting) down to Robbie Fox’s for some mid-ride fun. No matter how many years this happens, people are always surprised to meet us on the train. Many riders were stunned, but recovered enough to get out their cell phones to snap pictures. One man commented that he “liked white butts”, which meant Sunday must have been like Christmas for him. More than any previous year, we had people join in the fun spontaneously, with at least eight people dropping their pants and becoming part of the group without really knowing what was going on. Perhaps the weirdest encounter was an older couple who happened to run into the No Pants Ride last year, then again this year. They were determined to find out what was going on, and when we finally explained it they found the whole idea fun and hysterical. Apparently Fascinations sent out an email to their customers about us, so a big thanks to them. Maybe they’ll offer an Undie Discount next year – who knows? Over four hundred No Pants pictures are up on Flickr. These are fantastic and you really should check some of them out. Use the tag “nopantsaz” if you add your own. 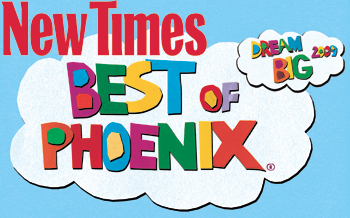 The Phoenix New Times had a no pants slideshow with The Good, The Bad, The Ugly, and the TMI. The Arizona Republic also had a no pants slideshow, and we were covered in the Downtown Devil, the ASU State Press, and Arizona Foothills Magazine. All were pretty good about getting with the spirit of it this year, and most event removed their pants! Channel 3 sent out a cameraman and we ended up on the evening news. We asked them not to disrupt the ride, and they were mostly good about that. They need smaller cameras. Guitarsenals on YouTube recorded both a 2D ride video and, yes, a 3D No Pants ride video! If you want to join us next year, or for any of our other flash mobs, join our email notification list and we’ll let you know when something is coming up.